Sam Wildow | Miami Valley Today Bradford fifth grade student Destiny Clark presents during the “Souper Bowl” party held this week in Intervention Specialist Tina Schmitz’s classroom. BRADFORD — A Bradford Elementary School classroom celebrated the Super Bowl by holding their own “Souper Bowl” party this week. Intervention Specialist Tina Schmitz hosted the party in her classroom, where students helped prepare meals for staff and family members before presenting on different kinds of soup and aspects of the Super Bowl. “I learned about chicken noodle soup. Chicken noodle soup helps you when you are sick,” fifth grade student Destiny Clark said. Destiny Clark listed the ingredients of chicken noodle soup and talked about its history. Fifth grade student Isaah Clark learned about the stadium where the Super Bowl LIII was played, Mercedes-Benz Stadium in Atlanta, Georgia, as well as about the city of Atlanta. “I’m learning about the Super Bowl. The Super Bowl is the championship game between the NFL and AFL,” student Hunter Gaines said. Gaines went on to say that between 111-114 million people were expected to watch the Super Bowl last weekend and that it costs between $3,000-$5,000 for a ticket to the Super Bowl. Students also listed their favorite things about the Super Bowl, including the sport itself and getting to eat special Super Bowl snacks. “My favorite thing about the Super Bowl is that it is always a competition. It is cool,” Destiny Clark said. 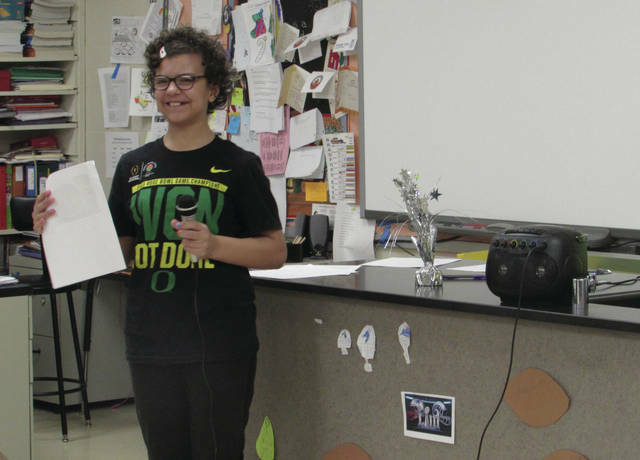 https://www.dailycall.com/wp-content/uploads/sites/30/2019/02/web1_Bradford-Destiny-Clark-1-cmyk.jpgSam Wildow | Miami Valley Today Bradford fifth grade student Destiny Clark presents during the “Souper Bowl” party held this week in Intervention Specialist Tina Schmitz’s classroom.